Guest blogger Alan Jessup-Peacock returns, writing about his beloved Concord Rangers’ cup tie at The Hive against Barnet. 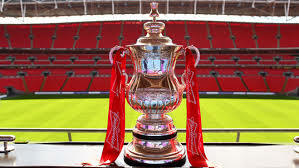 With a 3-0 defeat away to Barnet this past Saturday, Concord Rangers dreams of making the first round of the FA Cup ended for another season. The Beachboys went to The Hive ready to play, and eager to cause an upset over the team managed by Dutch footballing legend Edgar Davids, and who were as recently as May this year plying their trade in League 2. Sadly it was not to be, as the former league side showed that they were the better side on the day. Barnet moved the ball around exceptionally well, and we seemed to give them a bit too much space & respect at times through the game, which they took advantage of with their first two goals. The Beachboys had chances of their own, albeit fairly few. Steve King came away from the day with something more than expected, a swollen left eye, a large cut above said eye, and a number of stitches to go with it! To the Concord fans in attendance it looked blatant, but the referee appeared to miss it completely. It wasn’t the only decision I felt that the officials got wrong on the day, but there was no denying Barnet were worthy winners and I’d like to wish them the best of luck on their trip to Preston North End in the next round, and for the rest of the season. Of course, there’s always more to an away trip than just the football! The cameras from ITV sport were covering the game as its lead highlight segment on the First Round Draw show the following day, which made it a special day for the lads that’s for sure! If you can catch the show on demand then I would recommend it, if only for Leon Gordon breaking out his unique dance moves in the changing room before kick-off! Danny Cowley also played a prominent part, being interviewed both before & after the match; however his opposite number Davids was notably absent. I’m disappointed to admit that my overall opinion of The Hive & Barnet football club in general wasn’t great after Saturday though. Don’t get me wrong, it was a good day & experience for our club, but there were a few things that grated on our fans, and the team & committee. Firstly, all the fans were seated in the corner of the ground, with a large area behind the goal closed off. Upon questioning the stewards, normally away fans are allowed in that area, but it was closed off for us. This disappointed me & many of the others as standing behind the goal & taking part in the everyday banter is something that we love about football at this level. I felt the attitude of the stewards was poor; it was almost as if the belief was that Barnet were still a league club, and shouldn’t have to bother with a small club like ours. The away bar felt like it was an afterthought, basically a small shed-like structure under the stand, empty except for one tv screen. Add to that I felt the beer was overpriced, which left a bad taste in my mouth (the price, not the beer). There was an issue with the players food too, as they had been left just two plates of sarnies in the changing rooms for their post match meal. Now according to the rules, both teams are to be provided with hot food after the game, and this was only achieved when Bees keeper Graham Stack had a word with their chairman & got it sorted. That’s all the moans I have though, as the final parts of the day just highlighted to me why I love being a part of this club & being at this level. Prior to the game I had responded to a tweet from the Non League Show (broadcast on Radio 5 Sunday mornings at 05:30) about going to the game Saturday, and because of that they called me after the game for a short match report. I was bloody nervous to be fair, but it all passed without incident, and if you get a chance to listen to the show, originally broadcast this past Sunday, my little bit is around 17 minutes in! Admittedly though I was still a bit shocked when doing the match report, as I was struggling to get my head around a fellow fan being arrested! Nothing sinister happened I can assure you, but at the final whistle Mark Tate, a good mate of mine & fellow Beachboy and Hammer, ran onto the pitch waving his Concord scarf above his head. Mark made it to the players, even shaking Danny Gloziers hand, but when instructed by the stewards he left the pitch & returned to the stand. He was then escorted out of the ground, and after a talking to from the local plod, he was taken away & arrested! We all thought he’d just get a slap on the wrist, but clearly they have taken it more seriously than we imagined! The journey home on the players coach was its usual mix of banter, laughter & entertainment which is always great to be a part of. One thing though, it was highlighted that you should never, and I mean never leave your phone, tablet or iPad unattended in the presence of your teammates. No gory details, as it wouldn’t be fair to the player given what was found & exploited, but I can say with all the conviction in the world that Gary Ogilvie will not be making that mistake again any time soon! The lads now move on, with cup dreams shifting to the Essex Senior Cup & FA Trophy. And of course the Skrill South campaign will not be getting any easier as the season progresses either. But Concord Rangers can hold their heads high after a great, history making FA Cup run, and use that to drive us on to further success! I’d also like to close with a few words for our captain Tony Stokes. During the game Saturday there was surely a slight distraction hanging over his head, as his partner was coming to watch the game whilst ready to give birth to their first child at any moment! I’m happy to say that the game went by without incident for them, and since then they have announced that their baby boy was born healthy and well on the following Monday morning. On behalf of all the supporters at Concord Rangers, I would like to wish Tony & Meg congratulations and all the best for the future! #YAMC Alan Jessup-Peacock Chairman, Concord Supporters Association. Posted on October 31, 2013, in UTL Archive and tagged Barnet, Concord Rangers, FA Cup, The Hive. Bookmark the permalink. Leave a comment.